Ask the 25-year-old centre from North Vancouver what he would label a successful outing, and Sissons serves up a four-stat offering. “I think I’d have a couple of hits, a couple of shots on net, chip in with a goal and maybe be over 60 per cent in the dot – I think that would be a good night,” he said. Having already scored an NHL personal-best 13 goals and a career-high 28 points, Sissons has become an ultra-dependable two-way threat for the Nashville Predators. Fashioning a plus-25 rating this year, Sissons continues to up his game in the face-off circle, a skill he’s dedicated countless hours to over the years. 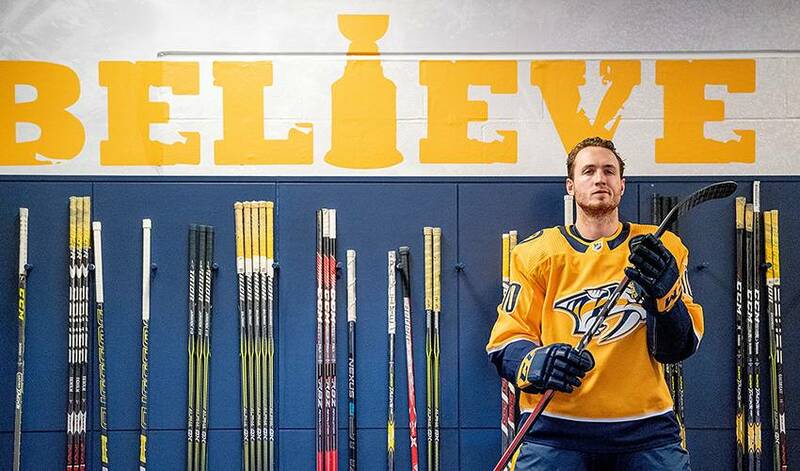 And while he admits scoring a goal is always a big deal, Sissons, who scored his first NHL goal on March 27, 2014, has come to embrace just how satisfying it is to contribute in other ways. The night of March 14 would be a perfect example. In 13:23 of ice time, Sissons scored a goal, recorded an assist, dished out two hits, played 1:09 when the Predators were short-handed, earned a plus-two rating, and capped the evening off with First Star honours. He’ll look to deliver the same type of performance once the Stanley Cup Playoffs get underway. But don’t expect Sissons, who has 19 points in 49 career playoff games, to alter his approach once the post-season puck drop takes place. “I don’t change anything,” said the player who scored a hat trick, including the game-winning tally, in Game 6 of the 2017 Western Conference Final.